You might see science as splashy headlines and a barrage of new results—but in the background are people with emotions and ambitions, politics, and a system that promotes publishing novel findings above all. A new paper on eel navigation highlights some of these systemic troubles. The results of the study weren’t all that surprising or Earth-shattering: A team of American and Swiss researchers seemingly found that European eels join the list of aquatic animals who navigate the globe by sensing the Earth’s magnetic field in some way. One of the paper’s initial reviewers deemed the authors’ research unfit to publish, but it ended up getting published anyway, the details basically unchanged, in a different but equally reputable scientific journal. The researchers behind the study already knew that several animals, like sea turtles and salmon, navigated the globe using positional data based on the Earth’s magnetic field. They wanted to know whether this was the rule or the exception among migrating aquatic animals. So they looked to eels. They scooped up a couple hundred juvenile European eels, brought them to a research facility, and put them in a cylindrical tank ten inches in diameter and six inches deep with twelve compartments around the edges, the whole thing wrapped with copper wire. The researchers recreated what the Earth’s magnetic field would look like in four different places along the eel migration route in the cylinder, and for each of the trials counted how many eels got trapped in which compartment. The eels’ choices demonstrated to the researchers that the animals have a sort of “magnetic map” of the Earth. 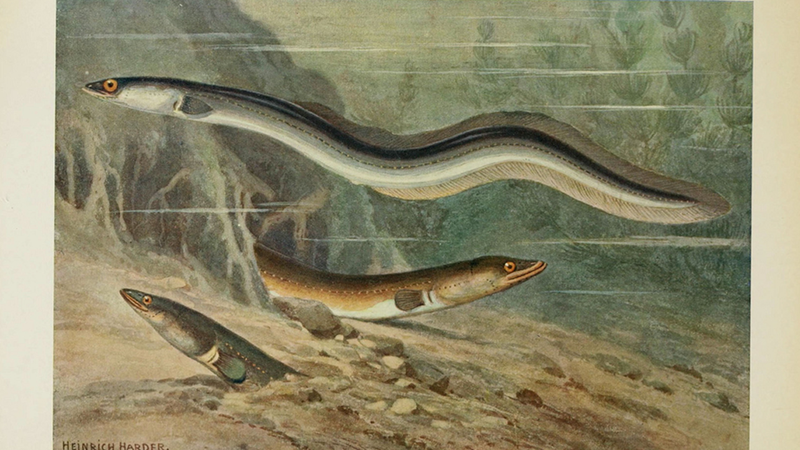 In other words, European eels use the planet’s field strength—as recreated in this experiment—and the field’s angle with the Earth’s surface to navigate. The team initially submitted their paper to the moderately high-impact journal Nature Communications, where several researchers reviewed it. One liked it, but one had many reservations. “I identified the major weaknesses of their study such as the use of the wrong life-stage: using 2 year old eels called juveniles and assuming they would behave as newly hatched larvae,” Caroline Durif, senior research scientist at the Institute of Marine Research in Norway who reviewed the paper, told Gizmodo. “Compared to larvae, the glass eels have undergone a metamorphosis and have a totally different sensory system.” Basically she thought the researchers were testing older eels, while simulating the environments of larval eels. “It’s like taking a butterfly and expecting to behave like a caterpillar,” she said. She also thought there were problems with the experimental setup and the statistics, and that the researchers should have used saltwater when they used freshwater. “The review process is anonymous, but I don’t have a problem saying what I think. It’s not a good study,” said Durif. Putman thought Durif’s review and the paper’s subsequent rejection could have come from competition. When I asked him about the resubmission, he immediately thought the comments were from one of Durif’s prior collaborators and blamed “professional jealousy.” He knows that Durif and her collaborators work on eels using the magnetic field to orient themselves like a compass (rather than like a map, as his team does), and had published on the topic previously. So Putman’s team resubmitted their paper to Current Biology with few changes, where it received positive reviews and was accepted with little trouble. The journal published that paper today. Other experts really seemed to like the paper. Jim Gould, professor in Ecology and Evolutionary Biology at Princeton University, told Gizmodo it was an impressive “tour-de-force.” “The rejection was a surprise to me,” he said. Gould proposed the magnetic map hypothesis that Putman’s team is testing way back in 1982. Durif said her research isn’t at all threatened by Putman’s—that in fact, his team’s conclusion, that eels have a sort of map of the Earth’s magnetic field, would only support hers. But she pointed out that another of the Nature Communications reviewers learned about her concerns and agreed with her assessment. She and a group of eel and magnetic orientation experts plan on co-signing a response to the paper. “I’m astounded that they have managed to get the manuscript published,” she said. So, we’re left with an ethical dilemma that plagues science: Is it okay to republish a paper rejected from one journal because you disagree with with a peer reviewer’s comments? I’ll let you mull that over, but if you extrapolate the case to the entire science publishing enterprise, you’ve got a serious problem. The implication is that you can probably get any research, no matter how bad the first comments are, published somewhere. Some “predatory” journals will take literally anything for a fee. But even reputable but less popular journals might have more lenient acceptance rates. But Putman’s team didn’t seek to publish in a lower quality journal. Nature Communications and Current Biology aren’t the flagship Nature and Cell journals from their respective publishers, but they’re still high-impact and receive a lot of attention both from scientists and journalists (I check both weekly for stories). Many scientists get rejected from the most selective journals and go for an easier one. In this case, the study authors moved between similarly selective journals. Ultimately, the problem goes beyond whether eels navigate with a magnetic map, an internal compass, or by some other means entirely. It lies in the fact that the system is built around scientists needing to get published in order to thrive. If a journal takes a story that another one rejected, there’s no incentive to go back and update your research in response to a negative review.